At PL Machinery we provide an extensive range of plastic ancillary machinery and equipment. We work closely with leading manufacturers to ensure we have the best range of products from the tried and trusted to the innovative and new. Our range of more than 450 products include vacuum, pneumatic and mechanical material conveying equipment. Volumetric and gravimetric dosers & blenders. Compressed air, hot air and dehumidifying material dryers. Water and oil temperature controllers, chillers & coolers. 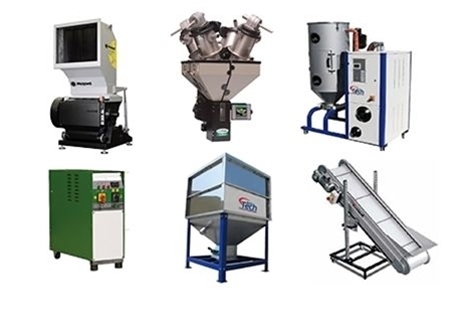 Granulators and shredders. Metal detectors & metal separators. Scrap recovery & downstream extrusion equipment. Belt conveyors, parts/sprue separators, box and bag filling systems. Bulk handling & storage. Specialist equipment for handling powders, flake & regrind.